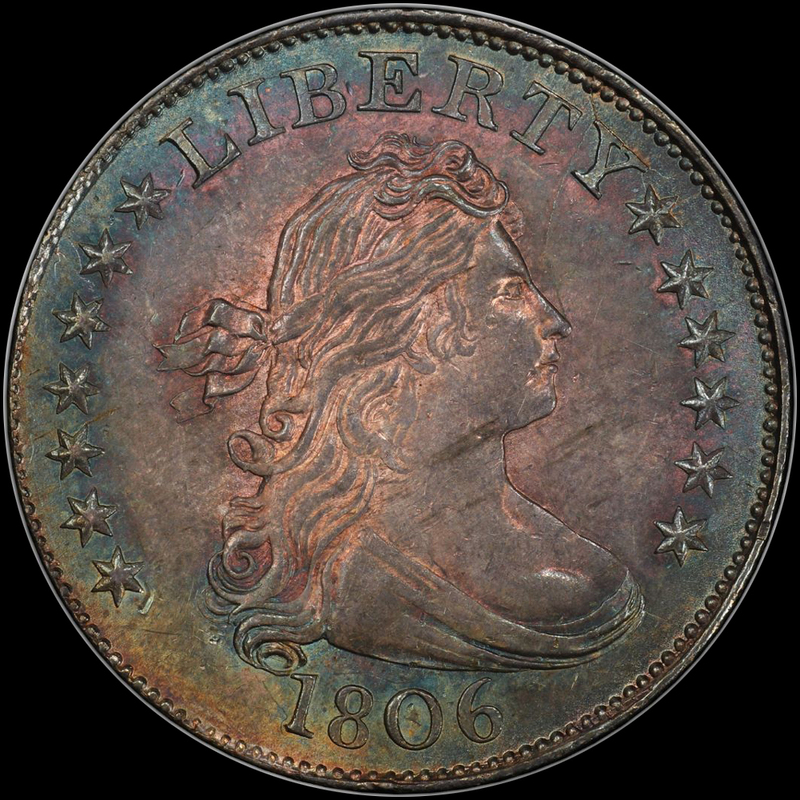 Save for the MS64+ we handled back in 2013 (these are so rare), this is one of the most phenomenal 1806 Bust Quarters we have ever seen! You bet this coin is VERY high end. Overall, the surfaces appear clean and smooth. When using a strong glass and looking around (they do not appear immediately), you will find some scattered light lines and ticks. But then it is an MS64, not an 64+. This coin is no where near MS63. surprising strong luster illuminates all of the colors and boldly beams from all over. Amazing and possibly album toning (TOTALLY ORIGINAL) covers both sides. Moderate shades of blue/pale navy/green/purple/gold swirl all over. Most important, this coin has NO spots or discolorations-however there are a few thin Mint grease marks on the obverse. Miss Liberty and the details are above average in strike. The quality and eye appeal of this near miss GEM are tremendous! PCGS 10, NGC 13, CAC 7. PCGS has graded only 3 higher. 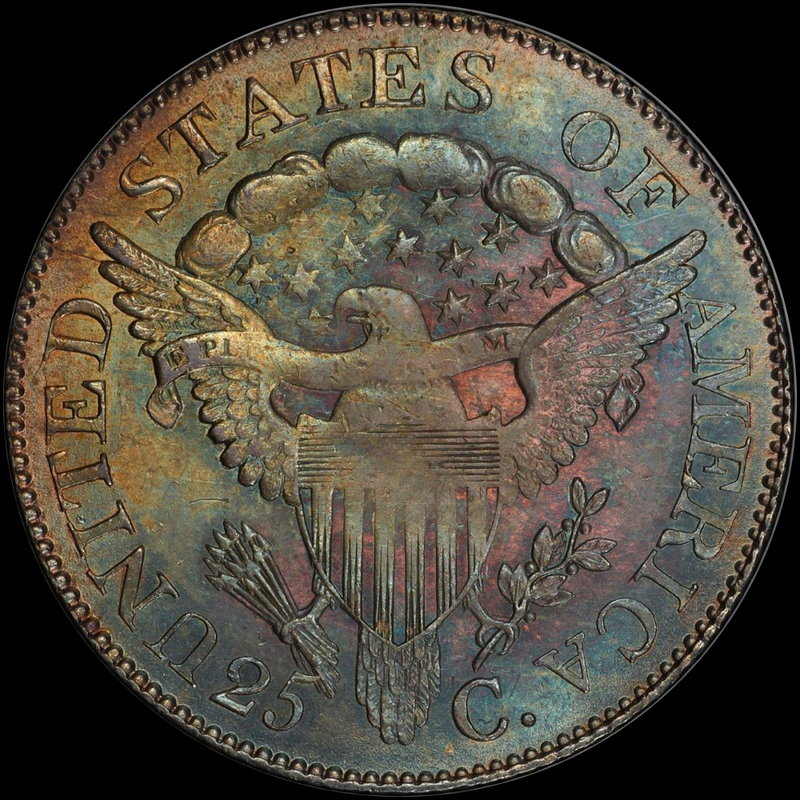 VERY IMPORTANT: the last PCGS CAC piece to sell in auction had serious SPOTS. It still brought $44,062.00 01/2015. Legend Rare Coin Auctions sold a NON CAC piece for $30,550.00 09/2016. The MS64+ brought $58,750.00 06/2017-and was darn close to MS65. Do NOT be fooled by the pops or what lesser NON CAC coins sell for. This is a rare coin in MS64 and 65 nice. We were surprised how reasonable we were able to buy this coin gorgeous piece. If you are building a Type or Bust Quarter set, how can you pass this up? These are simply NOT available and are certainly not available with this kind of color!